The world's largest fish market is reversing a month-old ban on tourists at its riotous early-morning auctions. Tsukiji market in the Japanese capital Tokyo had accused tourists of flouting hygiene rules and causing disruption with flash photography. Some tourists had been caught hugging, licking and even riding the huge frozen tuna that are Tsukiji's most arresting sight, an official said. 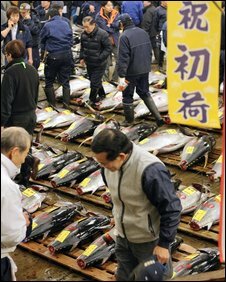 The daily tuna auctions often draw hundreds of visitors, many from abroad. A market local official told AFP news agency guards would start handing out strict guidelines to visitors. "We recognise that the auctions are part of the Tokyo scenery and popular tourist attraction," he said. He said tourists will be allowed to visit all areas of the market from 0500 to 0615 local time starting from 19 January. Access to the tuna auctions were restricted on 15 December, the start of the market's busiest trading period. Tsukiji is known as the source of fresh sushi and sashimi to top restaurants around the world.